Transmute those things that are no longer serving you! Anyone who’s purpose is to be a beacon of hope. outlines a vibrational scale of the Levels of Consciousness that ranges from 0 – 1,000. All energy levels below 200 tested weak or life draining. Calibrations above 200 are life affirming. Money is said to vibrate at the frequency of 125 … the energy of Enslavement … which is what it has done to so many, it literally enslaves them. At 200, Courage helps one begin the climb to empowerment. It is said the average person in this country vibrates somewhere in the vicinity of 250, the level of Neutrality. At 310, the level of Willingness, the lower levels of consciousness are no longer tolerated. 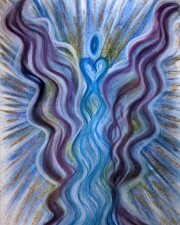 At 500, the level of Love, healing occurs and one sees others as themselves. Gold has been calibrated at a frequency of 540, the level of Joy, where love becomes unconditional and we begin the process of transfiguration, otherwise known as ascension. 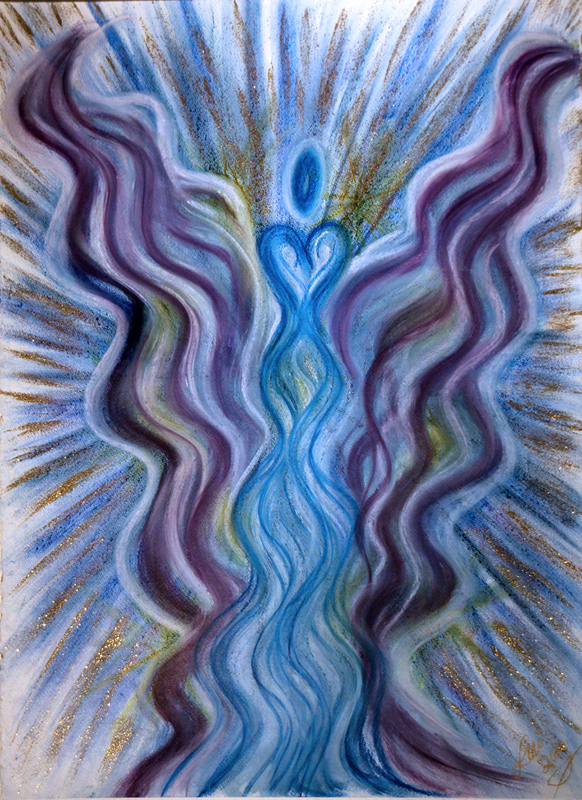 This angel, referred to simply as the Golden One, was created to help those who are ready move through their emotional blocks and limiting beliefs and transmute those things that are no longer serving them … to eliminate the lower vibrational thoughts and emotions that make it challenging to move through the ascension process … It’s goal is to raise your frequency to that of 540, the level of gold … Allowing YOU to become a golden light of love and joy … Helping you to shine brightly and become a beacon of hope. 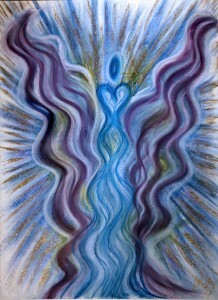 This beautiful angelic art print, was created by Visionary Artist and Angel Communicator, Lori Daniel Falk, to raise your vibrational frequency to that of GOLD, the level of Joy, where love becomes unconditional and we begin the process of transfiguration, otherwise known as ascension.. Pastels and mineral pigments, embellished with golden glitter on paper.